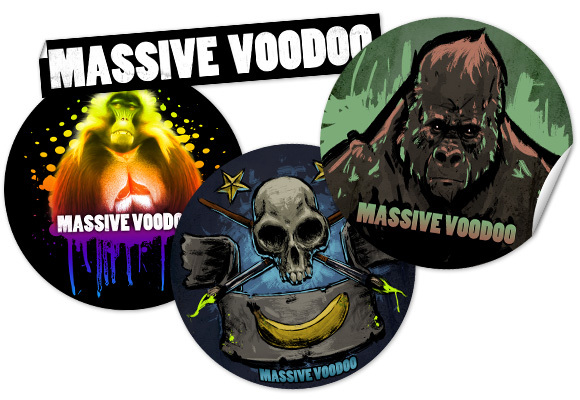 Alright you crazy cats, the Jungle Brothers are at it again – Raffa and Roman over at Massive Voodoo have launched an Indiegogo campaign to bring their masterpieces to light in printed form. Its something that I am pretty excited about and hope to see more of in the future. Whilst I am all for the information, tutorials and photos these boys supply for free via their website, there is still something special, almost magical, about the printed word… maybe I am showing my age, but I do love flipping through a good art book! “We want to bring you a high quality hardcover book with around 80-100 pages. The book pages will have a Din A4 size (8.3 in × 11.7 in). Here is a little Preview of what we are currently working on. With only 11 days to go, I am coming to the party late, but as Chaucer once said, “better late than never”*! However, what I can report on, coming at it this late, is that not only are the Massive Voodoo apes bringing an art book to print, thanks to the stretch goals over at Indiegogo all $35 backers will also receive a second A4 book (exclusive to the campaign) showing step by steps for some of the duo’s most well known projects. This should really be something special – head over to the campaign page and fill your boots. *well, technically he said “For bet than never is late.”, but thats how Yeomen must have spoken in C14!